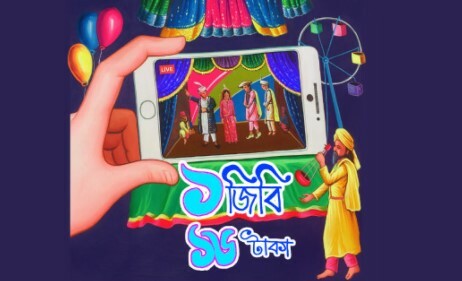 GP Boishakhi Offer – GP Shuvo Noboborsho Offer 2019! Hello Dear, welcome to GP Pohela Boishakh Offer 2019 – 1GB @ 16 TK. The Bangladeshi number one telecommunication company “Grameenphone” brings a super internet offer to celebrate the Bangla Happy New Year 2018 for their valuable customers, whose name is GP 1GB at Tk 16 Pohela Boishakh Offer. To activate the GP 1GB @ 16 Taka Shuvo Noboborsho Offer 2019, customers need to Dial USSD code *121*3350#. VAT + SD + SC included in 16 Taka. The Validity of GP Boishakhi Offer 1GB Internet 16 Taka, 12 Hours and validity starts from offer activation message received. To check the remaining balance of Grameenphone Pohela Boishakh Internet Offer 2019 – 1GB@16TK Offer, just dial *121*1*4#. The GP 1GB 16TK Shuvo Noboborsho offer 2018 runs until further notice. To cancel/unsubscribe the GP Boishakhi offer 1GB Internet at Tk 16 Offer, just dial *121*3041#. GP Pohela Boishakh Offer 2017 250 MB + 1p/sec Call rate 24 TK. All the Grameenphone Prepaid customers are eligible to enjoy GP Pohela Boishakh Offer 2017, 250 MB Internet 24 TK and 1p/sec rate cutter for 3 Days. 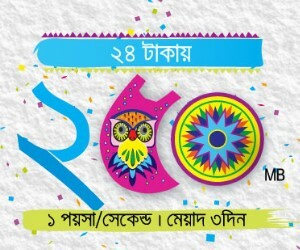 If you are Grameenphone prepaid customers and celebrate the Bangla Happy New Year 2017 by using GP Internet, we recommend you first check the GP Pohela Boishakh 250 MB Internet 24 TK + 1paisa/second rate cutter for 3 Days Offer 2017 Terms and Condition. To activate the GP Pohela Boishakh Offer 250MB@24TK + 1paisa/second any local number call rate, customers need to Dial USSD code *121*3065#. VAT + SD + SC includes in 24 TK. The validity of Grameenphone Pohela Boishakh Offer 2017, 250 MB Internet + 1paisa/second Call rate Offer 3 Days and validity start on offer activation day. To check the remaining balance of 250 MB Internet, just Dial *121*1*4# and 1p/second special any operator call rate offer, just dial *121*1*2#. The GP Pohela Boishakh 2017 Offer 250 MB @ 24 TK run until further notice. To unsubscribe/ Cancel/ deactivate the GP 250 MB Internet 24 TK or 1paisa/second call rate Pohela Boishakh Offer 2017, just dial USSD code *121*3041# or type “Stop RC” send to 9999. Thanks for staying with us a long time and visiting 1paisa/second special Call Rate Offer any local number + 250 MB internet at only 24 TK GP Pohela Boishakh Offer 2019 article. If you have any confusion or question or want to know more about the GP Pohela Boishakh Offer 2019, just comment here. We reply as soon as possible with a correct answer.